Dawn assumed that she was approaching her forties in excellent health. She had always eaten a fairly healthy diet, high in fruit and vegetables with plenty of chicken and fish and was a trim 9 stone. “I had also kept active with swimming twice a week, tennis in the summer and long and regular walks – I felt really well and healthy but as I was nearly 40, I decided to take advantage of the local GP’s health check,” explains Dawn. Like many GPs, Dawn’s local practice ran all sorts of illness prevention campaigns and was targeting cardiovascular disease in the 40 to 50 year olds in the area. Dawn received an invitation to go along for a heart and lung 40-year service. “A bit like having a 40,000 mile car service,” laughs Dawn. However, when Dawn went back to the surgery a week after having several samples of blood taken for different tests, and having an ECG and fitness test, she was not laughing when the doctor told her of the results. “I thought I would breeze in and take away proof that I was fit and healthy but, although my fitness was OK and there was nothing wrong with my heart, my blood cholesterol was sky high,” remembers Dawn. 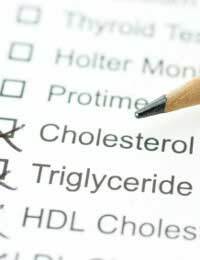 The target total cholesterol levels for adults in the UK, current in 2009, was set in 2008 at less than 5.0 millimoles of cholesterol per litre of blood. Over 50% of the population of the UK has higher cholesterol levels than this and 25% have levels over 6.5 millimoles per litre of blood. LDL cholesterol (the so-called ‘bad’ cholesterol) should be less than 2 millimoles per litre of blood. “My total cholesterol was nearly 10 millimoles per litre of blood and my LDL cholesterol was over 6 millimoles per litre,” says Dawn. “Even I knew that that was very high,” she adds. As Dawn was not overweight and did not smoke, there was very little she could do to change her cholesterol by changing her lifestyle. Her GP explained that, in cases like Dawn’s, it was most likely that there were genetic factors at work. Her cholesterol levels were high because of her genetic background rather than her eating or exercising habits. The GP therefore talked to Dawn about possible treatment. “I didn’t want to start taking drugs at the age of 40 but there didn’t seem much choice,” she says. With the high levels of cholesterol in her blood, even though she was fit and at a healthy weight, Dawn still ran the risk of developing cardiovascular disease as the cholesterol would cause her arteries to fur up and clog, potentially leading to a heart attack or a stroke. Dawn was prescribed a drug called a statin, which lowers cholesterol and needs to be taken once a day. “There are some scare stories about statins and they do have some side effects but millions of people around the world take them, some of them very ill with other conditions such as diabetes. Looking at it with a wide perspective, they are quite safe compared to some drugs,” she says. Dawn started taking simvastatin every night and has done so for the last four years. “I go for a check up every six months and have my cholesterol level checked. After the first year of treatment, it was down to 2.5 millimoles per litre, so the treatment definitely works,” says Dawn. Dawn will probably have to take the drug for the rest of her life – or until a better treatment is developed. “I have come to terms with it now and I know that I am protecting my health by taking a regular medication. I can’t say that I enjoy taking the pill every night, but I am OK with it now,” she says.